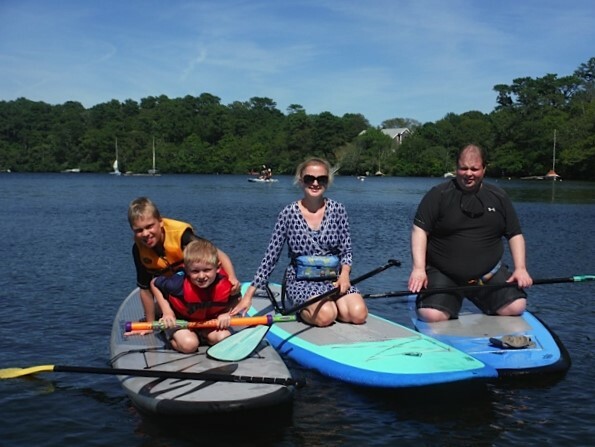 Last summer I got to cross an item off my list that I've been wanting to do for years--our family finally went stand-up paddleboarding! It was a lot of fun, and a lot of work--my body was so sore the next day! We went on a lake in Brewster with an instructor to help us. Sam was too little to do it so he sat on the instructor's board most of the time or hung onto mine (more on that later), which he was fine with. The instructor took pictures which is why we have photo documentation of this momentous occasion. We started out kneeling and paddling before working our way up to standing. Note Peter in the background trying to stay on his board. 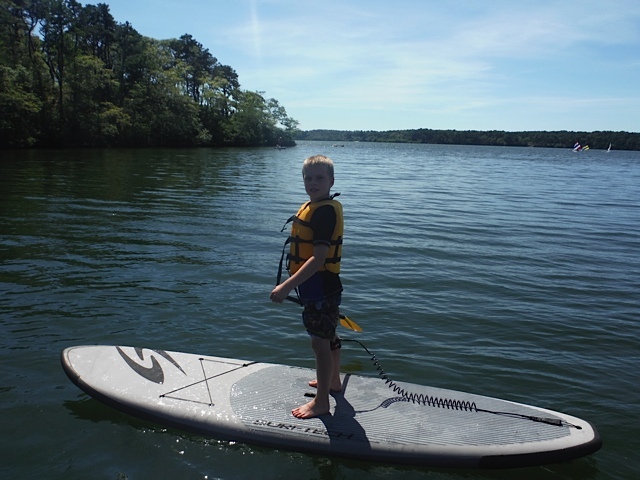 His body weight made balancing on the board very difficult the whole time we were on the water, so he spent a lot more time in the water than on the board! 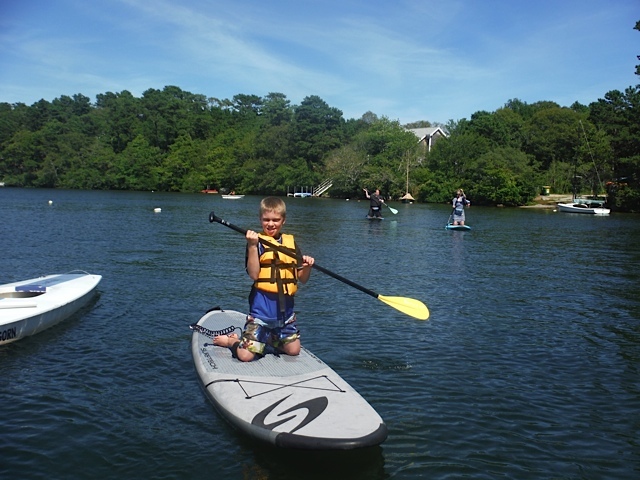 John had been paddleboarding twice before with his camp group from the Cape Cod Museum of Natural History. As with most things of an athletic nature, he was easily the best in our family at it. There are Peter and I successfully kneeling and paddling in the background! Unfortunately for Peter, that's about as successful as he got! But John makes it look so easy! And then I stood up! And I didn't fall in! 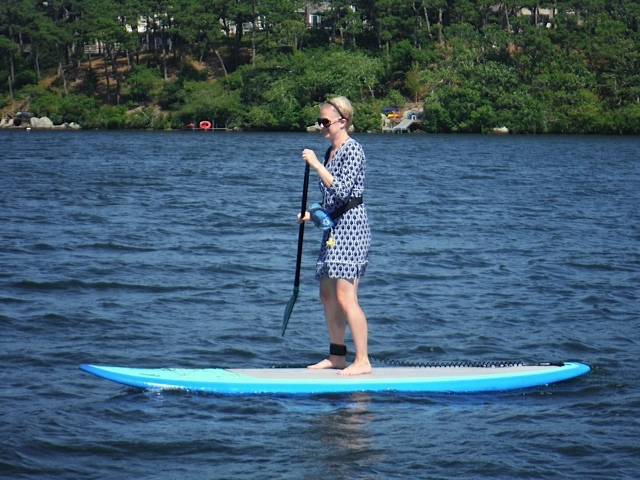 I'm very happy to report that I didn't fall in the water once, even though it was pretty breezy and the water was choppy. We went across the lake and back. I was a little scared the whole time and it was hard work, but it was fun! 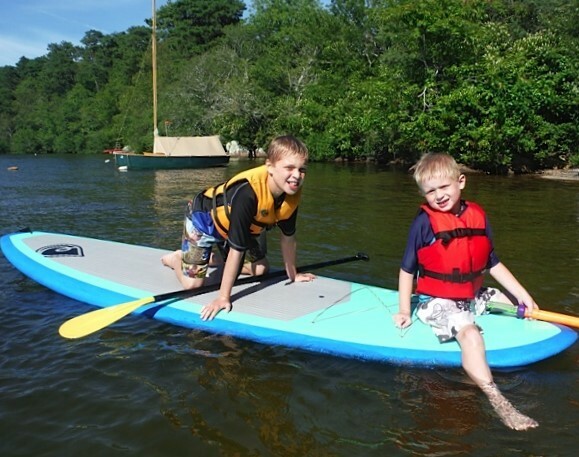 The instructor had to go and help Peter, who was struggling because he couldn't stay on his board. So Sam had to come hang onto my board, which made me go much slower because it created a lot of drag. 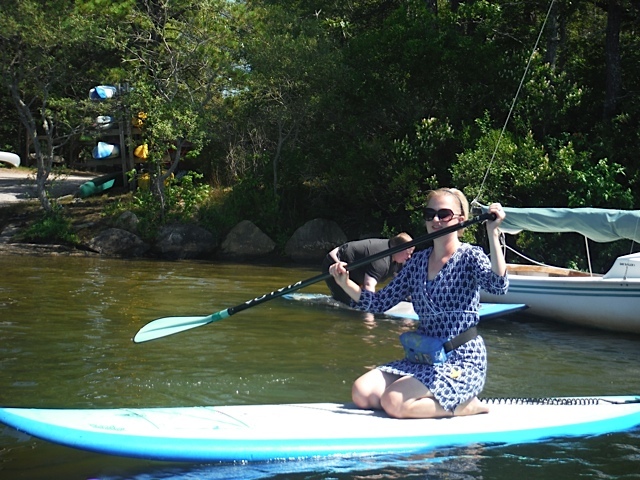 Then the instructor called out to me to have Sam sit on the board (duh Donna), and then, apart from my protesting arm and ab muscles, I felt like we glided through the water with the greatest of ease! Other than Sam getting bonked on the head with one of the paddleboards when John was messing around, the boys did great. They really do well in the water. And on the water. Like I said before, it was fun and it was a great workout. 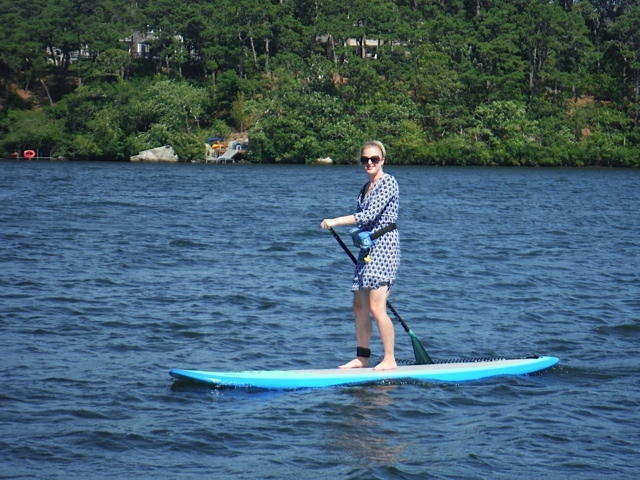 Stand-up paddleboarding appeals to me more than kayaking does (kayaking has always scared me--I'm afraid of the kayak flipping over and being trapped in it, which happened to a guy in my hometown who sadly drowned when that happened to him). I'd like to get a couple of our own stand-up paddleboards and start doing this every summer. I want to get good-quality inflatable ones so that we can easily transport them in the back of the car instead of having to mount them on top of the car, which would be a pain and a definite deterrent to me ever doing this on my own.